Every autumn at the tail end of hurricane season, yachting enthusiasts and industry insiders travel to South Florida to inspect boats big and small from all over the globe. We are, of course, talking about the Fort Lauderdale International Boat Show, the largest in-water boat show in the world, scheduled this year for October 31 to November 4. The 2018 edition marks 59 years of this event, which hosts more than 1,500 boats—along 10km of floating docks—1,200 exhibitors, and 110,000 visitors at seven locations around Fort Lauderdale. Not only will visitors find all kinds of vessels—from superyachts and sailing yachts to jet boats and runabouts—but also exotic cars, watersports gear, and everything nautical. Here are the yachts we think you should not miss. 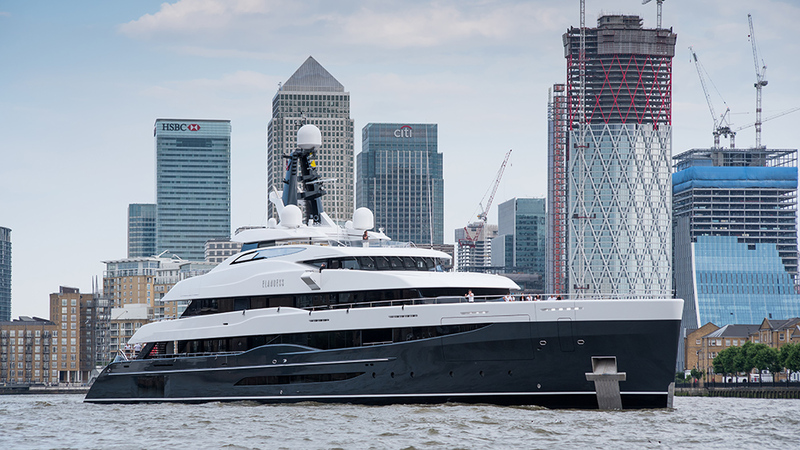 This 74-metre superyacht surprised London last summer when it journeyed up the Thames, just weeks after its launch. Elandess also promises to wow Fort Lauderdale as the queen of the show. 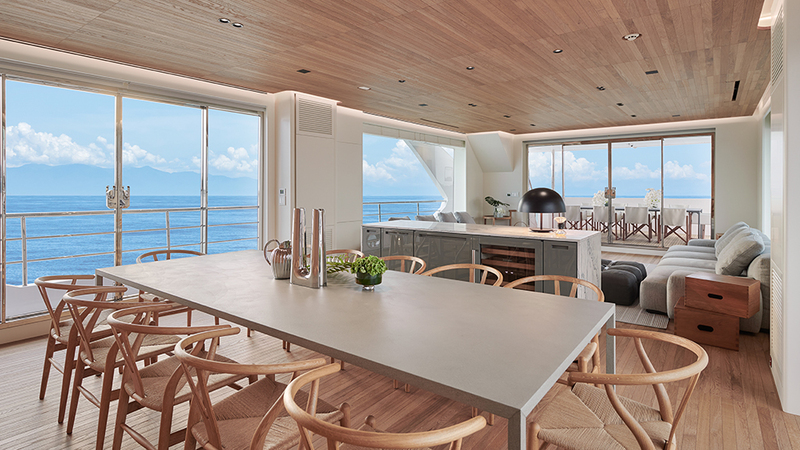 Designer Harrison Eidsgaard created a very special gigayacht with German builder Abeking & Rasmussen, including expansive social areas across the interior and exterior that equate to special family moments for the owners. Standout features include an 2.5-by-8- metre swimming pool up on the sundeck, and the Nemo Lounge beneath the waterline that includes a window into the ocean below. The yacht has seven suites, including the master apartment, for 14 guests and crew quarters for 24. Gene Machine is not a new launch, but its American owner wanted it to be part of FLIBS in order to show the world the possibilities of Amel’s 180 Limited Editions range. The exterior design by Tim Heywood includes a distinctive grey hull with an orange stripe along the water, and a profile that slopes downward as it moves aft. The sundeck is devoted to the sun, with an open space forward, Jacuzzi in the middle, and yet more open space on the aft end. It’s probably the best viewing platform for any yacht its size. Enzo Enea’s interior includes an expansive saloon with floor-to-ceiling windows and a formal dining table in the forward section. Among the yacht’s many distinctive features are a “command chair” that rises above a table and other chairs, like a judge sitting on the bench, in the cockpit area, and a mural of sea creatures, including a grinning shark, in the children’s bedrooms. It’s a fun yacht, designed for spending time in the tropics. Also not a new yacht, but the first hull in the Oceano 43 line that launched last year, the 42-metre Namaste is the first Mangusta Oceano to hit the States and is making its first appearance at FLIBS. Designed inside and out by Alberto Mancini, Namaste is built in steel and aluminium, the long-range tri-deck is built in steel and aluminium. Highlights of Namaste’s exterior include the foredeck glass-bottomed pool, which provides a skylight to the master bath below, and a dedicated beach club, thanks to a forward tender garage. Inside, sliding-glass doors on each side of the main saloon pull in natural light and sea breezes, and opens up the entire space to the outdoors. Namaste accommodates up to 12 guests in five staterooms, including the master suite with fold-down balcony. Seven crew members are housed in four cabins, one of which is the captain’s. Namaste has a top speed of 15 knots, a cruising speed of 11 knots, and a range of more than 4500 nautical miles. Created Francesco Paszkowski Design, the new Custom Line 120 combines pieces of aeronautical, automotive, and residential design, as well as that of racing yachts, to create a sporty planing superyacht. A noteworthy feature of the Custom Line 120 is the glass door between the aft cockpit and the main saloon. It rests at a 45-degree angle, and to open it tilts up into the ceiling and also opens horizontally. This makes for a true indoor/outdoor living space. Paszkowski and the Ferretti Group designers created the interior decor. Besides the main-deck master suite, four en suite staterooms reside belowdecks—two VIPs and two singles. Crew quarters are forward and include four cabins. The flybridge offers up a hot tub and lounging space as well as stairs that lead to the forepeak dining and lounging area. Two garages are located at water level—one at the stern and one forward. All told, the 120 can carry two tenders and a three-person Jet Ski. Horizon’s “CC” designator stands for Custom Collection, which means that owners get their new yacht the way they want it, from the exterior and interior layout all the way to the custom decor. In the case of the 35-metre Adiago, which will debut at FLIBS, the client commissioned Cor D. Rover, a noted Dutch superyacht designer, and the builder’s in-house design team to create a Horizon like no other. The designers gave a potentially conventional-looking exterior a more contemporary look by turning most of the foredeck into a sloping social area, adding large windows on the main deck, and creating a softer, less angular stern than most yachts its size. Add to that, a huge saloon with floor-to-ceiling windows, Dessie’s custom designer furniture from Italy, a Listone Giordano wood floor, and large beach club, and the yacht becomes a long-distance haven. The 115 is powered by twin 1200kW Caterpillar diesels that deliver a top end of 17 knots, and it cruises at 12 knots. Being on a 30-metre-plus yacht that reaches a top speed of 30 knots is a highly unusual experience. 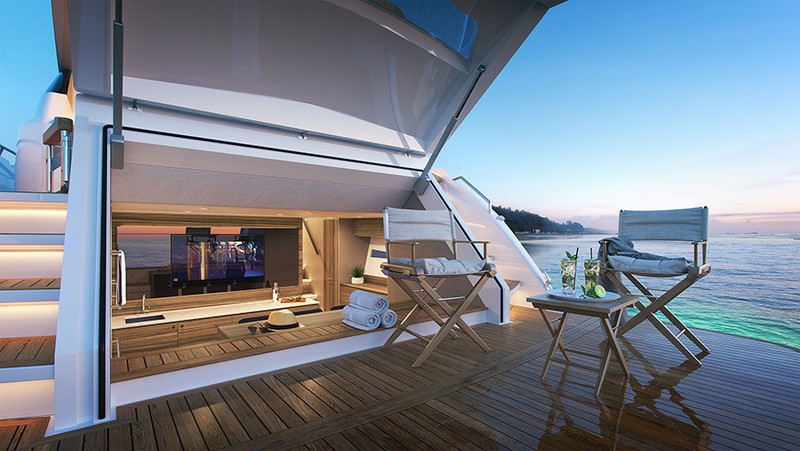 Add to that the contemporary design and open space of Sanlorenzo’s SL106 and you get a one-of-a-kind ocean runner. 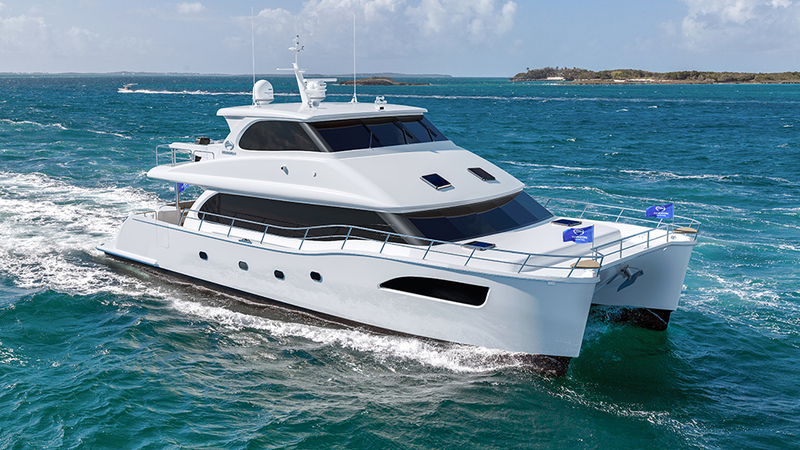 The planing yacht, which makes its US debut at FLIBS, offers two MTU diesel power options. The 1966kW twins, the larger of the two choices, give SL106 a top-end speed of 30 knots. The 1815kW option shaves off four knots, but is still notably faster than most yachts its size. 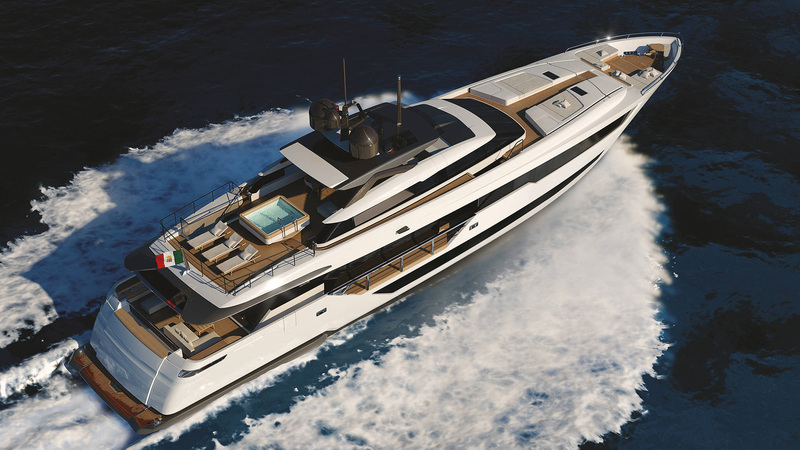 Sanlorenzo’s design team went for an open interior, from stern all the way to the bow, that features a large saloon at the rear and dining room/family lounge in the front of the yacht. The Italian builder’s design team combined wood, marble, linen, and silk with bronzed and polished steel to create a contemporary but quite elegant interior. The SL106 also has opening terraces in both the saloon and owner’s stateroom. Nice touches like transparent side walls on the flybridge and teak handrails on the stern show that Sanlorenzo has thought about every feature on the yacht. Delivered to its owners this year, the 30-metre semi-displacement Hargrave raised-pilothouse yacht MB3 features exterior styling and naval architecture by Hargrave and a soothing interior from Yacht Interiors by Shelley. Not common on European models, MB3 has a country kitchen with a casual dining space and kitchen counter to watch the chef in action. Four staterooms accommodate eight guests in a full-beam master stateroom with his-and-her bath, two VIP staterooms, and a twin cabin that converts to a king stateroom. A hot tub on the flydeck beckons guests up top to the bar and seating area—or maybe it’s the other way around. And a beach club at water level provides easy access to watersports, as well as a great space for sunning. Two 485kW Caterpillar engines give MB3 a top speed of 23 knots. FLIBS sets the stage for the world debut of the first yacht in Ocean Alexander’s new Revolution series: the 90R. The 27-metre tri-deck motor yacht was designed by Evan K. Marshall along with Italian firm Arrabito Naval Architects. The flybridge’s upper deck is equipped with an indoor skylounge as well as an open-air bar and grill for cooking up some quick comestibles. Stonework is used extensively throughout the vessel, and on this deck, the bar and cabinet countertops are made from Cambria Berwyn stone. The main deck is home to the saloon, including its expansive views through floor-to-ceiling windows, as well as the master stateroom, which is outfitted with his-and-her closets and a bathroom with floors and walls covered in stonework. A deck below, guests can find respite in two regular cabins and a full-beam VIP stateroom. The lower deck is also home to the beach club, which stands out by not only having a bar area but also a skylight that can bathe the area in natural light or provide a window to the stars at night. Sanlorenzo’s new SX88 is called a “crossover” boat because it combines the features of a motor yacht and a much larger explorer yacht. The Italian builder actually raised the new concept to a higher level with clever innovations like a fully open-plan main deck (thanks to the absence of a lower helm station) that stretches the full length of the interior. The design allows the owner to choose between a long, open layout or a forward area with an owner’s stateroom. The SX88 also has an open stern that holds a 4.5-metre tender and personal watercraft for quick deployment. The area also has a sizable beach club. Sanlorenzo worked with Italian designer Piero Lissoni on the first interior and Officina Italiana Design for the quirky exterior. 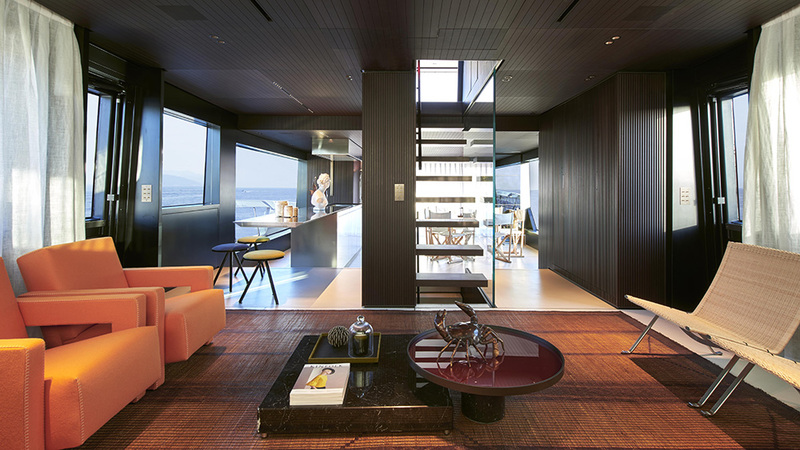 Lissoni’s interpretation for the interior is another choice for onboard living, offering the ambiance of an open sea loft. The yacht has a semi-displacement hull that reaches 17 knots. Its hybrid diesel-electric powerplant allows an owner to use the lighting, systems management, and other non-propulsion systems for up to eight hours in zero-emissions mode. The SX88 is a breakthrough yacht on many levels. The 26-metre Numarine 26XP represents the new breed of mini-expedition yachts. 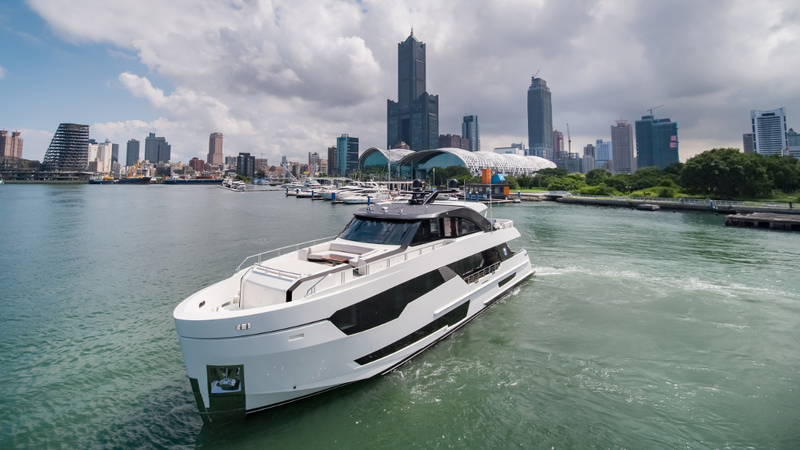 Along with its sister ship the 32XP, the 85-foot 26XP has a highly efficient hull, high freeboard and intrepid profile, and a special flybridge that covers about two-thirds of the hull’s length. The bridge has 100 square metres of usable deck space, allowing owners and guests to find their own private areas with space left over on the aft deck for a tender. The yacht has a generous, full-beam saloon on the main deck, with full-height windows, a dining area, and settees for congregating. Designer Cal Yalman also left abundant space belowdecks for the four staterooms, including the full-beam master suite amidships, where the yacht is widest. A VIP and two twins comprise the other three. Numarine worked with Silent Line to make the yacht as noise- and vibration-free as possible, using techniques that are more often applied to superyachts. The yacht comes in a displacement-hull version, which has a maximum speed of 13.5 knots. At eight knots, its range is 3000 nautical miles. The semiplaning version has larger engines and pushes the 26-metre yacht to an impressive 28 knots. 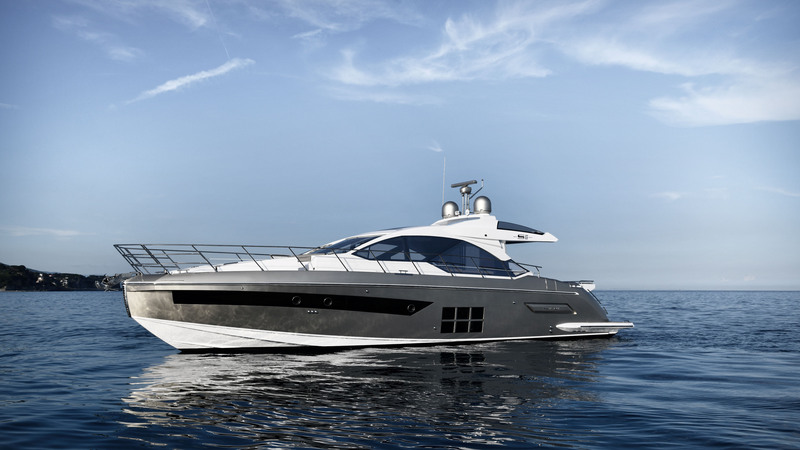 The new 74 Sport Yacht from British boatbuilder Sunseeker has its US debut this week. Borrowing design and performance features from the Sunseeker Predator 74, the 74 Sport Yacht offers up a huge flybridge, with helm station, seating, dining, and sunbathing spaces. A bimini shade and wet bar are optional. A large sun pad and U-shaped dining area forward of the helm on the foredeck provide an excellent location for a sunset cocktail or a meal with an amazing view. This 22-metre 10-inch yacht sports a 38-knot max speed, a cruising speed of 28, and a range of 330 nautical miles. The tender garage stows an optional Williams 395 SportJet. The new Princess F70 has mated a sporty-looking bridge with a coupe superstructure that gives it a distinctive profile. The flagship of the Princess flybridge line, the F70 is available with the Allure Collection, a package of amenities, finishes, and high-end decor. The flybridge is a showpiece of the yacht, including a U-shaped dining area, full wet bar, aft sun pad, and forward lounges. Inside on the main deck, Princess designed the galley at the rear of the saloon so that owners and guests can eat outside in the cockpit, or if the weather is not cooperating, at a dining table in the saloon. The UK builder’s Allure package includes soft suedes, bronze tint mirrors, Japanese wall coverings, and hand-stitched detailing that give it a superyacht sensibility. The master suite has a private stairway. 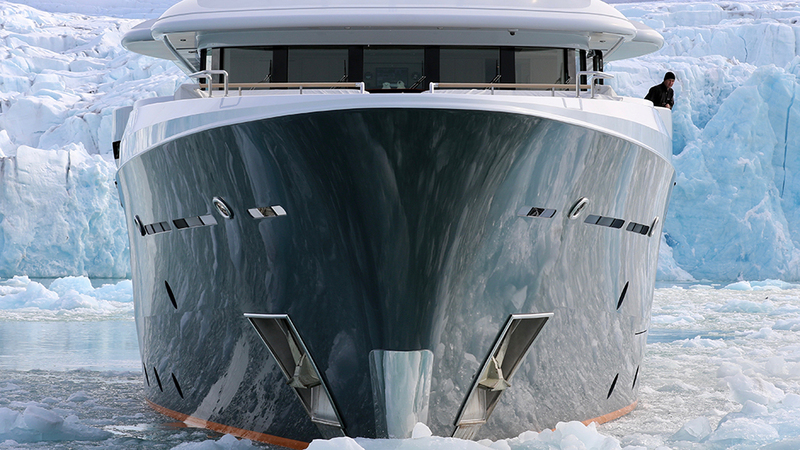 The F70 is powered by twin 1200kW MAN diesels that deliver a top-end speed of 36 knots. 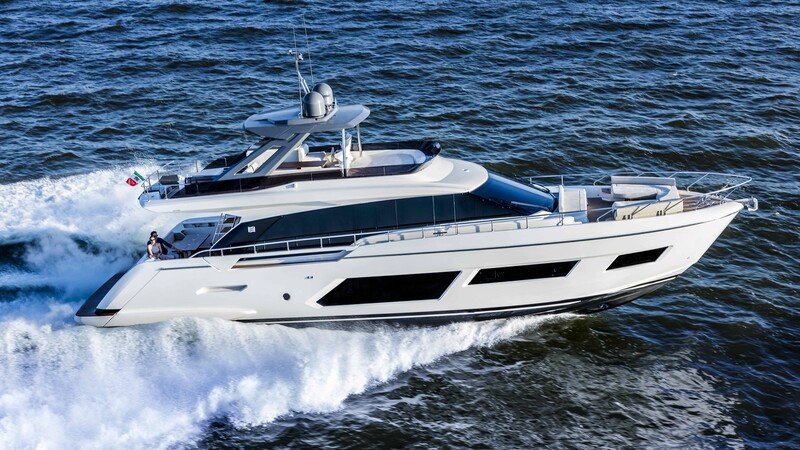 The Ferretti Yachts 670 debuted in Cannes in September. The flybridge yacht sports exterior design by Filippo Salvetti—his first for the brand—and the Ferretti Group and an interior also designed by the Ferretti Group. 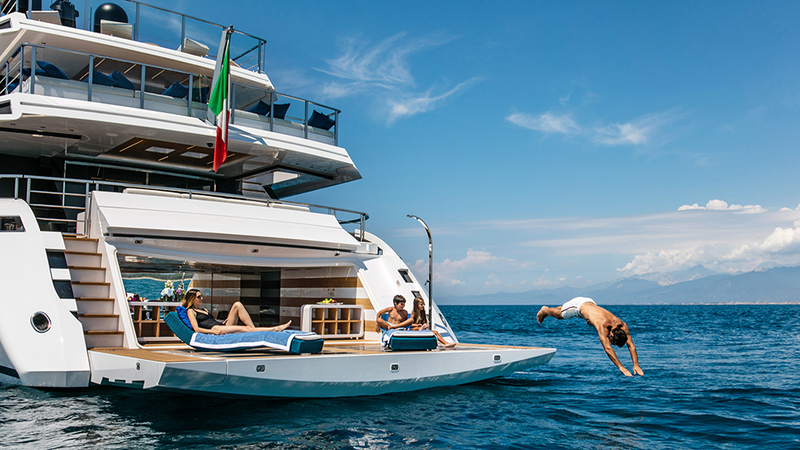 The 20-metre yacht sports a 25-square-metre flybridge with loungers, bar, dining table and settee, and a foredeck fitted with lounging space. An open-plan main deck provides a spacious feel, as do the many windows. Belowdecks, guests will find a full-beam master suite, a full-beam VIP stateroom forward, and a twin cabin. An optional version comes with a captain’s cabin. Ferretti offers two engine choices: either a pair of 745kW or 895kW MAN diesel engines, which propel the 670 to either 28 or 32 knots. The yacht’s cruise speed is 25. The 19-metre power catamaran from Horizon Yachts was created in collaboration with Lavranos Marine, JC Espinosa, Winchester Design Group, the Powercat Company, and Horizon Yachts. 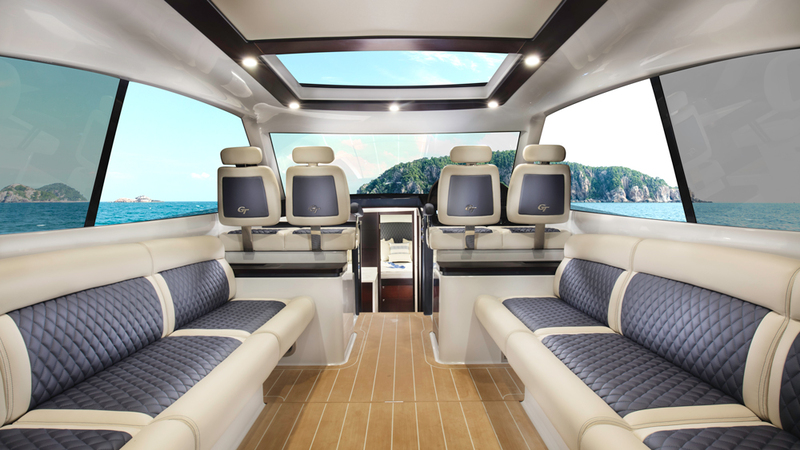 Available either as an open flybridge or skylounge, Horizon offers several layout options and custom interiors. Choose either the on-deck master stateroom or the open-plan main deck, with four en-suite cabins, two kings and two queens. The Power Cat PC65 can be used for extended cruising at slow cruise speed or cruising at maximum speeds. You may also choose the yacht three king staterooms and a separate crew cabin, making it eligible to be managed for charter under Horizon’s charter division. All options include luxurious interior finishes and large deck spaces for entertaining. Known for its sturdy trawler-style yachts, Grand Banks has added another dimension to its GB 60 Skylounge. 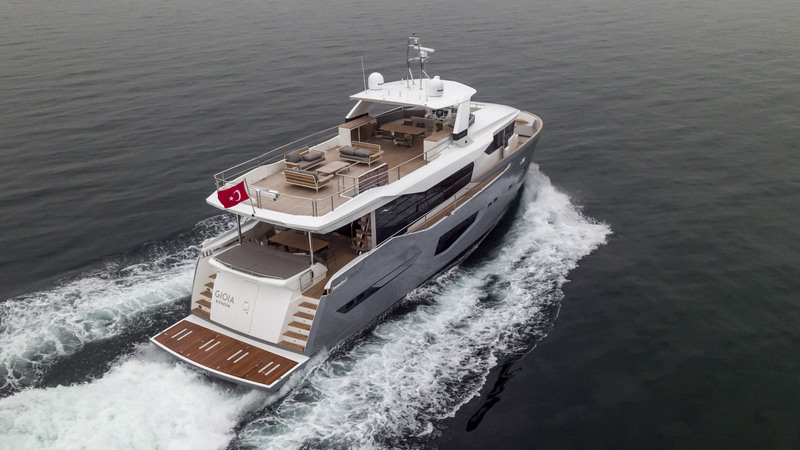 The 18-metres enclosed pilothouse lets the owners cruise comfortably in both hot and cold climates. Instead of an open flybridge, which makes guests subject to the prevailing weather, the area can be heated or air conditioned. Besides the twin helm chairs, it has a large settee for guests as well as a day head. Grand Banks took great care to ensure the enclosed area works aesthetically with the rest of the 60’s profile, while using carbon fiber and other lightweight materials to keep its weight as light as possible. As a result, it runs at an impressive 31 knots with twin 670kW Volvo D13 diesels. At 10 knots, it has a range of 2,000 nm. The 60-footer has a three-stateroom layout that showcases Grand Banks’ high levels of craftsmanship, including golden teak and contemporary fabrics. HCB’s new Estrella, making its debut at FLIBS, now assumes the centre-console throne. Powered by five 466kW outboard engines, Estrella is all yacht. Seakeeper stabilisers make Estrella a sure-footed platform, counterbalancing motion while running at speed offshore or trawling in five-foot seas. HCB gave Estrella an 8200-litre fuel capacity for a long range. Bertram’s 61 sportfisherman makes its official debut at FLIBS. Its egg-shell-blue hull was designed by Michael Peters, whose studio has created many iconic American yachts. Peters gave the 61 a strong, powerful exterior with a traditional Bertram look, including features like tinted, wraparound windows in the saloon and a long, open foredeck. The boat is an important launch for Bertram, a comeback boat for the company after it was acquired by Italy’s Gavio Group in 2015. Gavio, which also revived the legendary Baglietto and CCN yacht brands in Italy, decided to do away with Bertram models from its previous owner and start from scratch. The thoroughly modern 61 is a fresh departure for Bertram and will go mano a mano with traditional competitors like Viking and Hatteras. 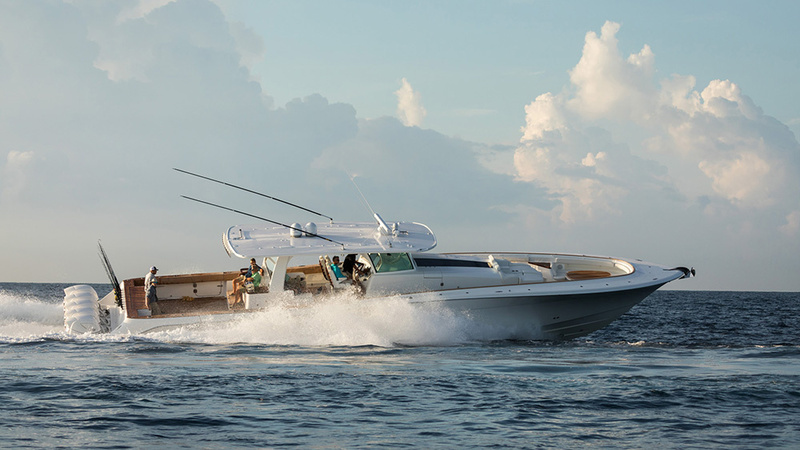 The boat’s small centre flybridge is ideal for maneuvering during encounters with billfish, while offering dual helm chairs and lounges along the sides. 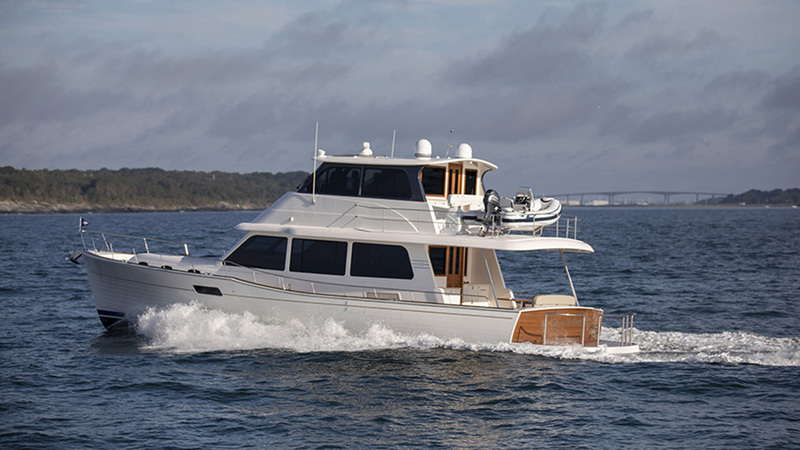 Below, the teak cockpit is designed for serious fishermen, with wide-open deck space, in-deck fish boxes, transom livewell with an aquarium view, 12-volt electric reel sockets, and many more angling features. Bertram also installed a Seakeeper gyro stabiliser to eliminate roll when the boat is running at top end or, more likely for sportfishing, at slower trolling speeds. Peters designed the interior with an open-plan saloon and galley, using white decor, dark hardwood joinery, and marble surfaces across the galley. There is no lower helm station, so the area feels more like a waterside apartment than a typical sportfishing yacht, especially with the incredible view via the panexless wraparound windows. The four staterooms belowdecks share the same beautiful joinery, white walls, and modern Italian design, including the stylized sink and shower in the master head. Like the original Bertram Moppie, which employed the first deep-V hull shape , the 61 was also designed for ocean running, but with a much larger and more complicated running surface and twin 1400kW CAT 32 diesel engines. Just the name gives an idea of the sporty look and versatile design of Maritimo’s X60. The boat offers an owner’s choice of configurations for its aft section, including a Beach Club version, Queen version with extra VIP cabin, and Regency Suite with an enlarged master stateroom. Or the owner can simply decide to use the space as a tender garage. The Australian builder designed the X60 with a straight-drive shaft and efficient running surface; so efficient, in fact, the boat consumes only 109 litres per hour at 28 knots while reaching a top end of 34 knots with its 690kW Scania diesel engine. It will run even faster with the upgraded 745kW Volvo diesels. The Maritimo has a sleek profile, thanks to the flat-roof coupe design, though the interior remains large and spacious. It features a large saloon and full-beam master stateroom. The X60 will make its US debut at the Fort Lauderdale show, while Maritimo just announced a new X50 version that will launch next year. This French-built motor yacht from Prestige, making its American debut at FLIBS, was designed with optimum exterior space, starting up on the flybridge. The forward section features a sunbed, with a twin-seat helm beside. At the rear is a table and lounge for alfresco dining. The cockpit below has another settee that can be converted into a second dining area or sunbed. Just aft, the swim platform connects to a large tender garage. Prestige designed a proprietary Ship Control system that allows the owners to monitor and control separate onboard functions. The saloon is cloaked in leather and tweed fabrics in an open-plan layout that is lit up by large windows on all sides. A private stairway to the owner’s suite at the rear is a welcome rarity on this size yacht. 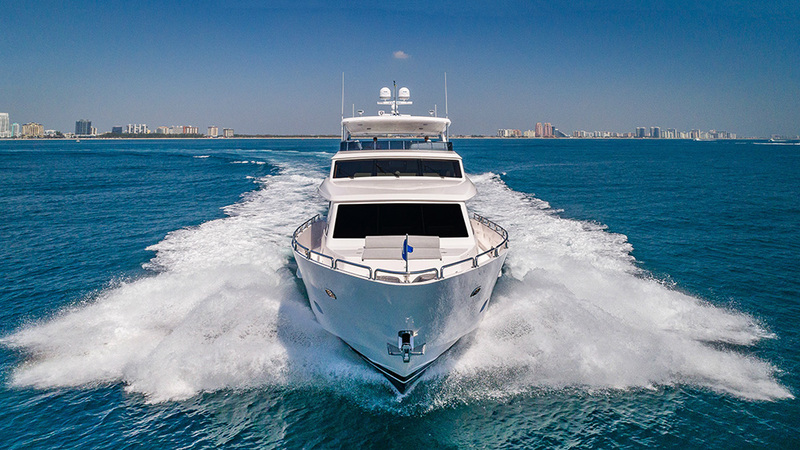 Powered by twin 447kW Cummins engines, the 590 has a top end of 29 knots and cruising speed of 23 knots. 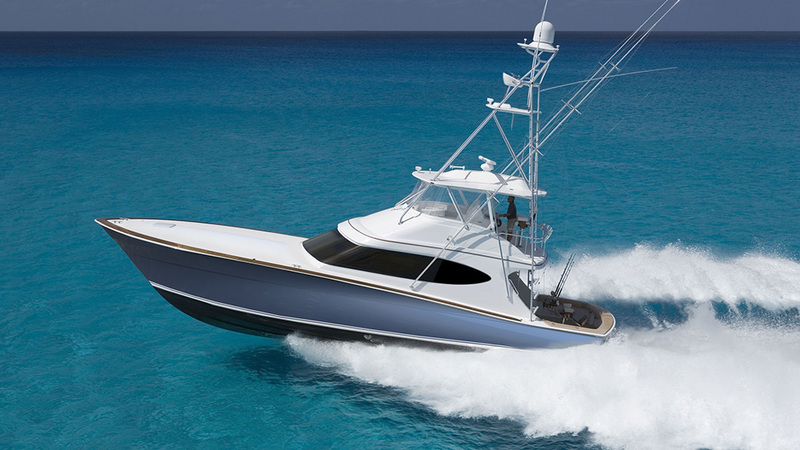 There’s a soft, almost baby-like quality to the new Hatteras GT59. Its all-white hull and the constant curves (around the front section, up on the bridge area, and even the large windshield) create the impression of a simple, elegant boat with no rough edges. First impressions, of course, often need to be revised. Such is the case with this bluewater convertible, designed for fishing many miles offshore in the most inhospitable conditions. 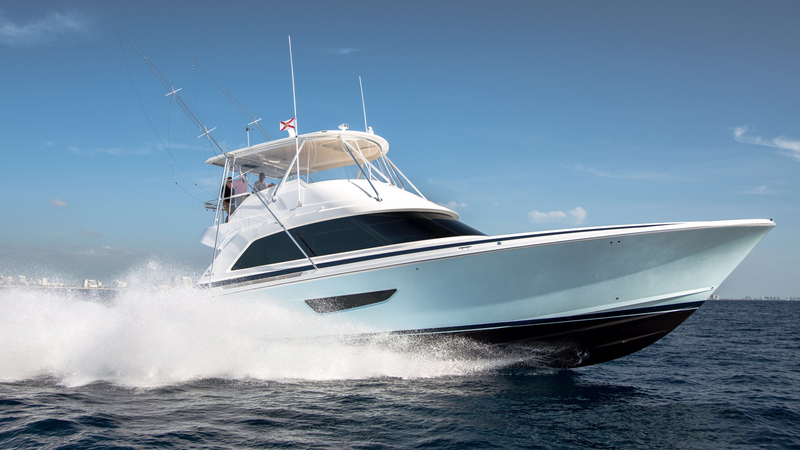 The GT59 has all the fishing amenities that a serious angler would want, including a single wooden fighting chair in the cockpit, a bridge with an open stern so the captain can back down on billfish if she or he needs to, and a tall tuna tower for sighting fish in the distance when electronics can’t find them. 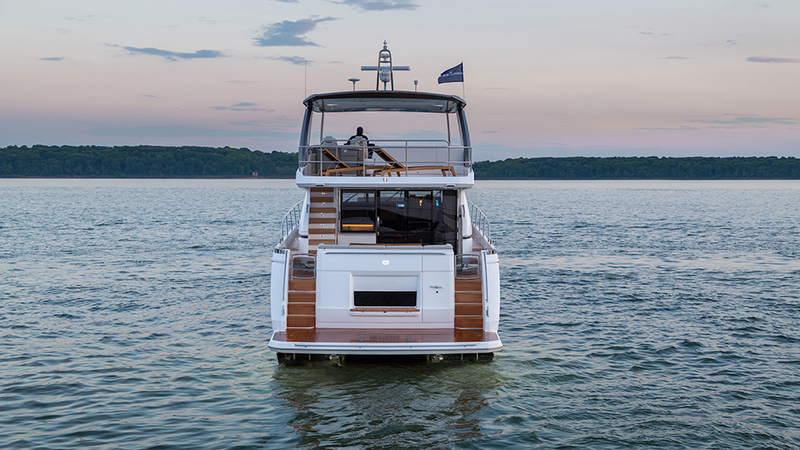 At the same time, the soft edges turn the new Hatteras into an exceptional cruising machine. In front the helm station, a twin seat has a leg rest that lets guests sit back and relax while the boat is running. The interior has a large saloon, bedecked in wood, with a galley forward and island table with four stools. In the rear section is a large lounge. The GT59 comes in different configurations, all with three staterooms, depending on an owner’s preference for the number of beds. It also has two standard bathrooms, with a third being an option, unless the owner wants a tackle centre. The boat has standard twin 1200kW Caterpillar diesel engines that give it a top end greater than 40 knots. 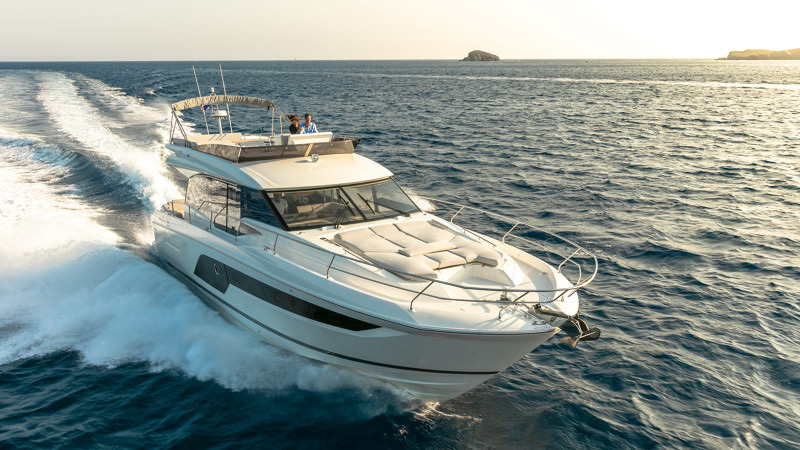 The S series has always shown the yachting world how innovative, unorthodox, and stylish Azimut can be when it is unchained from convention, and the new S6 promises to be a continuation of that tradition. Stefano Righini, Azimut’s longtime designer, has really made his mark with the S series, and the 18-metre S6 shows that he can reach into the future by embracing the past. The boat has classic cues of the S series, including its muscular profile, large enclosed cockpit, and the six-pane through-hull window in the master suite. On this boat, Righini created a protected upper sanctum with the extended hardtop, an area near the helm where the owners and guests can relax in shade and air-conditioning, but also enjoy the sun with the opening sunroof. The upper area also has a full galley and bar for large social events. For sun worshippers, there is a three-person sunbed on the bow and three more sunbeds on the stern of the yacht, along with a large lounge beneath the hardtop’s overhang. Having the galley on the main deck left Azimut’s interior designer Francesco Guida extra space below for the three staterooms, including the full-beam master in the stern (with two tables and chairs beside the window, walk-in closets, and adjoining bathroom), and a large VIP cabin in the bow area. The third stateroom has twin beds. Guida did a wonderful job, enhancing the interior’s natural brightness with light-colored woods and fabrics. It is modern without being overly formal, something the S Class has excelled at for 15 years. 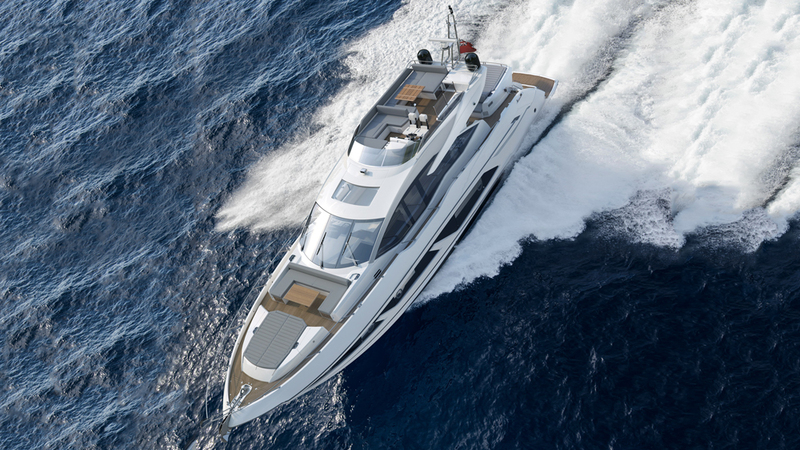 The new Azimut will be powered by twin 522kW Volvo IPS D8 engines, giving it a top-end speed of 35 knots. Its cruising speed is 30 knots. Given its 18-metre length, the boat feels unusually spacious, both on the main deck and in the staterooms. The GT Series will incorporate a unique hull design (made from vinyl-ester cored e-glass and complemented by a fully infused, 100 per cent carbon-fibre deck and superstructure) that enables the yachts to slice through the water instead of wasting energy by maneuvering on top of it. Initial sea trials met the company’s projection of a top speed of 42 knots and a cruising speed of 35 knots. At 35 knots, the fuel consumption was only 182 litres per hour, and at 25 knots the fuel consumption was 109 litres per hour, making the GT50 one of the most efficient cruisers on the market today. The first Palm Beach GT50 Express will be on display at the Fort Lauderdale International Boat Show. And the GT50 Open will be unveiled at boot Düsseldorf in January 2019. Production for the GT60 model is currently underway, with a debut planned for September 2019.